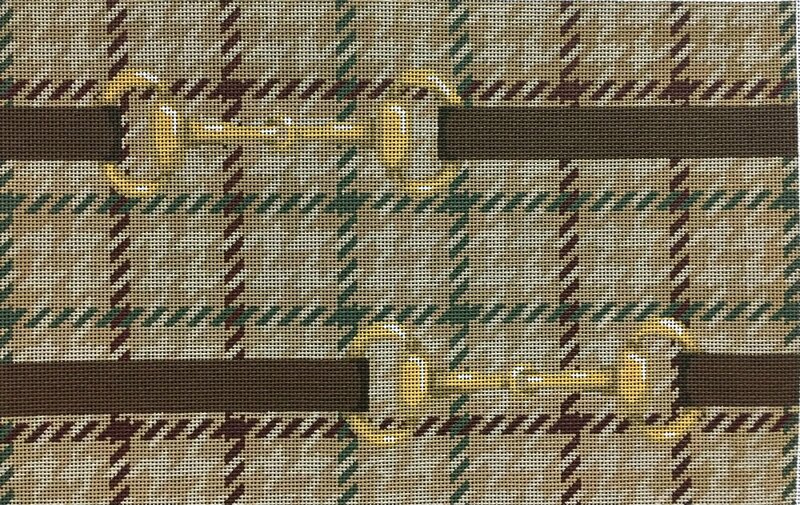 This stunning equestrian handpainted needlepoint design from Associated Talents features bridle bits on an elegant taupe guncheck fabric background. The design area measures 16" x 10.33". Can be purchased with or without fibers. If you select cotton we will send DMC cotton floss. For wool or silk we will send Planet Earth boutique fibers which are single-ply for 13 mesh. Makes a beautiful needlepoint pillow to suit country decor. For stretcher bars we recommend a pair of 20" and a pair of 14" and some thumb tacks. This Associated Talents handpainted needlepoint canvas usually ships within 1 week.